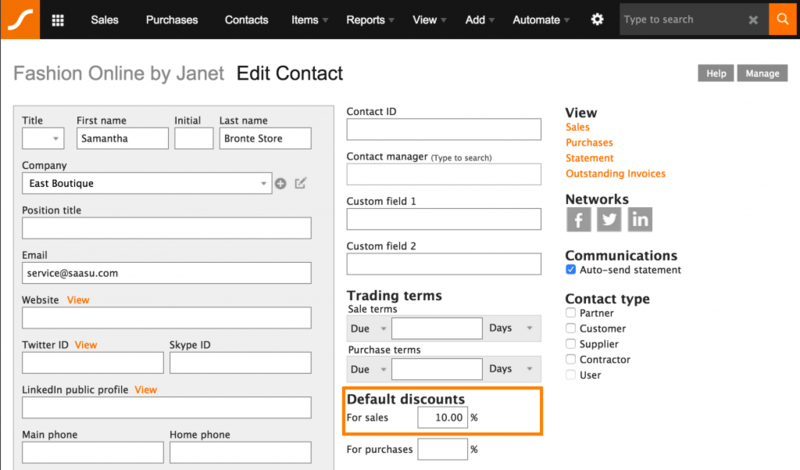 Discounts can be applied as a default on your customer or supplier Contact record or on Sales and Purchase transactions using the Item layout..
You can set a contact to receive a percentage discount, each time they are added to an invoice. You can nominate a discount percentage manually during invoice creation. At the moment you can handle early bird/early payment discounts by following the simple process outlined below. In this example, you issue a sale for $1,000 and issue a Sale Adjustment/Credit for -$100. You apply a Sale Payment to both at once for $900 which you received as early payment from your customer. Discount or early bird rate. Amount in your standard PDF Invoice Template. Sales screen using the Display Notes on Invoice field. If the offer is taken up, create a new Sale Adjustment/Credit transaction for the savings amount. Ensure this is a negative amount. Apply the payment to both the original Sale and the new Sale Adjustment/Credit Sale in order to close them both as paid.